Seeing parallels between religions as diverse as Christianity and Buddhism depends on a familiarity with the themes expressed in their mystical and esoteric writings. For example, it is thought by many that Buddhism denies the existence of a soul and that it aims at a nihilistic destruction of the psychological self. Likewise, many believe that Christianity focuses on heavenly rewards for earthly virtue, through a peculiar filial relationship with a supernatural being, mediated by arcane, seemingly arbitrary laws or commandments. The reality is that Buddhism and Christianity are neither the same, nor are they entirely different. But after many years of reading the commonalities have come to the fore, and the differences seem much less significant. I don’t spend time worrying about how reincarnation can be reconciled with the Christian afterlife, because in terms of my own practice these questions are not significant. What are significant are things like the Christian perspective on pride in relation to the Buddhist perspective on the illusory nature of the self. For as he (viz., Lucifer) was endowed with divine splendour, and shone forth among the other higher powers by the bounty of his Maker, he believed that he had acquired the splendour of that wisdom and the beauty of those powers, with which he was graced by the gift of the Creator, by the might of his own nature, and not by the beneficence of His generosity. And on this account he was puffed up as if he stood in no need of divine assistance in order to continue in this state of purity, and esteemed himself to be like God, as if, like God, he had no need of any one, and trusting in the power of his own will, fancied that through it he could richly supply himself with everything which was necessary for the consummation of virtue or for the perpetuation of perfect bliss. This thought alone was the cause of his first fall. What he’s describing is the fall of Lucifer, who was the greatest of the angels but succumbed to pride and so fell from heaven. For while he believed that by the freedom of his will and by his own efforts he could obtain the glory of Deity, he actually lost that glory which he already possessed through the free gift of the Creator. That last line is especially significant, as it undermines the freedom of the will and sense of agency that are themselves the greatest symptom of our pride. This is where I see a direct parallel with Buddhist teaching on the nature of the self. An important part of this teaching is that our sense of self and our cherished identity are a delusion that we take for real. Enlightenment amounts in part to seeing that these selfish thoughts and impressions are not substantial, that there is no self who sits in control of our will and actions. This is what “puffed up” means in Cassian’s words. Pride is an inflation of our sense of self, til it obscures the reality of our total dependence on God. The problem with the Christian teaching on pride is that we often interpret it in very limited, human terms. We think pride is just about arrogance, and selfishness is about being inconsiderate of others. Christianity is predominantly a devotional religion, focusing on the individual relationship with God. Yet in the depths of this relationship the mystics report a sense of their own negation in God’s love. That is, they experience a union with God that totally changes their own sense of self and agency. Buddhism is not typically a devotional religion. Instead it focuses on this experience of the negation of the self, without attempting to express in devotional terms the reality into which the self is subsumed. But in both cases, the obstacle to this insight is the delusion of control, of will, of self-sufficiency. Buddhists will not talk of it in terms of pride and humility, and Christians will not talk of it in terms of self and no-self. Nonetheless it is my belief that they are speaking of the same thing. An interesting theme in my current studies is the boundary between self and other, and how this boundary shifts as a consequence of different theories of free will. For example, a simple theory of free will might hold that one acts voluntarily except when one’s actions are the result of physical coercion or ignorance. Non-coerced actions can be considered the product of free will. But a more complex theory of free will would recognise that sometimes we act in ways that are difficult to own as fully voluntary, such as eating dessert when you’ve sworn you want to lose weight. No one has physically coerced you to eat the dessert, yet in the broader context of your wishes, intentions, and subsequent regrets, it doesn’t seem quite right to say that eating the dessert is representative of your free will. Accordingly some have suggested that we are not free when we act in accordance with our lower appetites. In the same vein, others have said that ‘free’ actions are those which arise from truly rational considerations. 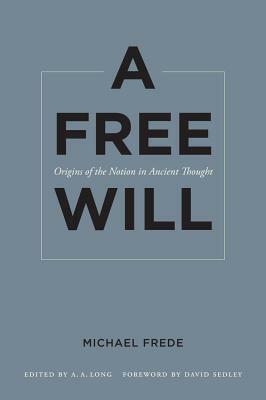 To exercise free will is to act in accordance with rational desire; anything less is a kind of slavery. But in accepting this more nuanced view of the will, we implicitly redraw the boundary between self and other; the coercive forces we face are no longer external, physical agents but internal appetites and desires. What is the ‘self’ that is the subject of these appetites, the self that might somehow will instead to follow reason? This internalisation of the self is not a necessary outcome of a more complex view of free will, but it does make such a perspective easier to adopt. We start viewing ourselves a little like a homunculus positioned somewhere back behind our eyes, controlling our body and attempting to reason and make choices while assailed by powerful appetites and desires. The internalised self may be a promising line of inquiry for when I start examining Chinese philosophical texts on the topic of free will. Take, for example, this extract from the QingJing Jing or ‘Classic of Purity and Rest’, a Daoist text developed supposedly in response to the emerging Buddhist theme of ’emptiness’ typified by the Heart Sutra. Now the spirit of man loves Purity, but his mind disturbs it. The mind of man loves stillness, but his desires draw it away. If he could always send his desires away, his mind would of itself become still. Let his mind be made clean, and his spirit will of itself become pure. As a matter of course the six desires won’t arise, and the three poisons will be taken away and disappear. The reason why men are not able to attain to this, is because their minds have not been cleansed, and their desires have not been sent away. If one is able to send the desires away, when he then looks in at his mind, it is no longer his; when he looks out at his body, it is no longer his; and when he looks farther off at external things, they are things which he has nothing to do with. Sending the desires away may imply a similarly internalised view of the will, such that one is able to control or manipulate mental faculties as though they were external objects. In that condition of rest independently of place how can any desire arise? And when no desire any longer arises, there is the True stillness and rest. That True (stillness) becomes (a) constant quality, and responds to external things (without error); yea, that True and Constant quality holds possession of the nature. He who has this absolute purity enters gradually into the (inspiration of the) True Dao. And having entered thereinto, he is styled Possessor of the Dao. It is intriguing that the Daoist text portrays desires as an intrinsically disturbing force that should be ‘put away’. This presents another opportunity for fruitful comparison with Stoicism, where such desires are viewed as the product of our assent to false beliefs. This is, in turn, reminiscent of the Buddhist assertion that the unsatisfactory nature of existence can be traced back to ignorant desire. If we put aside desires, our mind and spirit will revert to their natural purity and stillness, bringing us back to the influence of the Dao. This is consistent with Wang Bi’s much earlier commentary on the Dao De Jing, the heart of the Daoist Canon, in which he depicts the goal of the sage as embracing ’emptiness’ through renunciation of private interests and desires. I think this critical attitude toward desire is a crucial part of serious religious practice universally. We should not be surprised to find it emerging in the context of Daoism, Buddhism, and even Stoicism, as part of a broader attempt to discover the root of humanity’s failing and misery, and the path towards a renovation of the human spirit.